Print, copy and scan with Ricoh’s new and powerful MP W6700SP Wide Format Printer. The W6700SP will deliver sharp digital images with crisp lines and accurate details at a speed of 6.7 pages per minute. This large format printer has a 320GB Hard Disk Drive and a versatile Document Server, enabling you to store, preview and recall jobs. 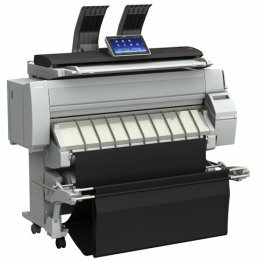 The MP W6700SP is equipped with a 2-roll drawer that supports multiple media stocks and types from letter size up to 36 inches. With the mobile options available on the Ricoh W6700SP, administrators can view, monitor and make changes via a web browser, allowing you to maximize productivity from wherever you are. 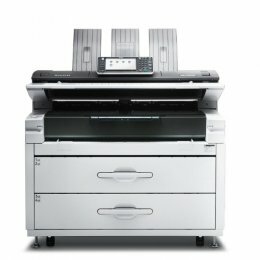 Print, copy and scan large-format documents with the Ricoh MP CW2201SP. This Ricoh wide format printer will produce detailed maps to rich CAD drawings and plans in vivid color or crisp black-and-white. With its fast drying ink and minimal dot spread, the CW2201SP will deliver exceptional image quality on every job. Enjoy convenient features such as front access to paper rolls and ink cartridges, an attached paper basket to neatly collect and stack printed output, and direct print from a USB drive or SD card. Architects, engineers, contractors and designers will capture new opportunities with the MP CW2201SP. 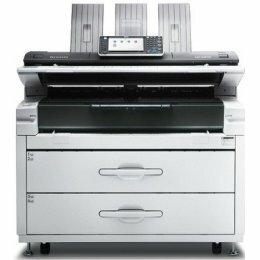 The MP CW2200SP is a versatile MFP that will allow you to easily present design plans and documents. 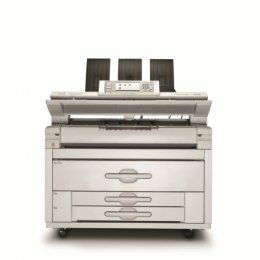 With a 600x600 dpi copy-and-scan resolution and 1200x1200 dpi print resolution, the CW2200SP will deliver clear, crisp full-color drawings, text, line-art, graphics and photographs. Enjoy the convenience of USB and SD card media slots and a user-friendly, full-color, tiltable control panel. Not only will you increase productivity with the Ricoh CW2200SP, but its host of advanced security features will keep your documents safe and secure. The Ricoh Pro L4160 Wide Format Printer features eight ink cartridges configured to your preferences, and a three-way intelligent heater that maintains proper temperatures pre-printing, during printing and during drying to ensure only best results. 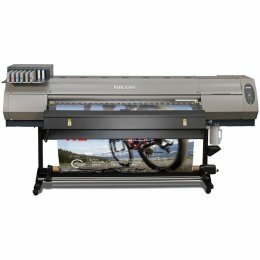 This Pro L-4160 printer can output jobs up to 63” wide and as long as the roll you’re printing on. With its eco-friendly features, the Pro-L4160 will keep costs low. The Ricoh MP W7100SP is a high speed, monochrome wide format printer. This MP-W7100SP printer features a compact design, combining reliability, durability and ease-of-use. With its eco-friendly features, the MPW7100SP will keep costs low. 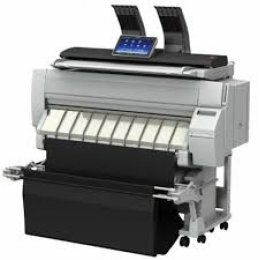 The Ricoh W8140SP is a wide format printer, printing in black and white at 14 prints per minute. Control the MPW8140SP using its 9 inch LCD touch panel. Make use of features including scan to email, folder, USB and more on the Ricoh MP W8140SP Printer. The Ricoh Aficio L4130 Printer will print attractive, crisp and vivid graphics in color. Prints will be out instantly with zero drying time. Print upto 63 inches wide and as long as your paper roll with the Ricoh L4130 Wide Format Printer.